In September of 2017, a lawsuit was filed to obtain records under FOIA in a request to obtain documents regarding Andrew McCabe’s conflicts of interests. Then in February of 2018, the Office of Inspector General issued a 39 page report complete with allegations relating to the former Deputy Director Andrew McCabe. The investigation included evidence of McCabe’s lying and failure to adhere to policies and practices regarding media contacts. Since that time, McCabe went to crowd-funding to pay for his legal fees as he pursues legal protection as well as a lawsuit against the FBI and the Department of Justice. He has officially sued both. The complaint is found here. 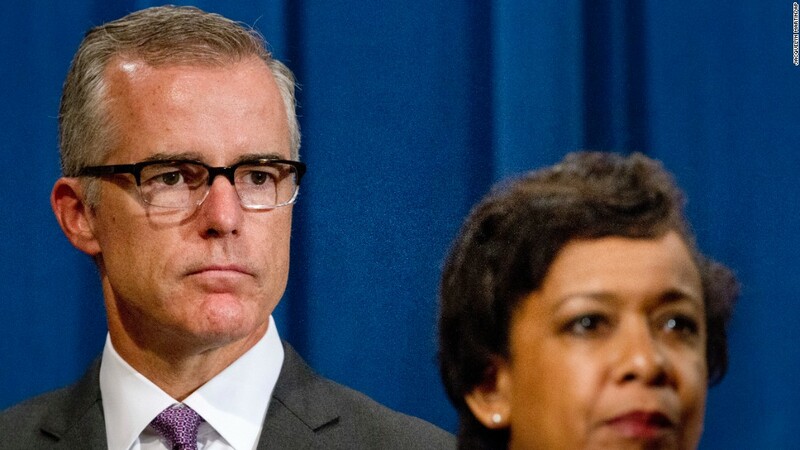 A lawyer for fired former FBI Deputy Director Andrew McCabe is suing the FBI, the Justice Department and its inspector general for refusing to turn over documents related to McCabe’s termination. The firing stripped McCabe and his family of their health care benefits and delayed his ability to collect a federal pension, which he otherwise would have been able to draw on his 50th birthday. McCabe’s lawyer, David Snyder, maintains in a new lawsuit that the dismissal violated federal law and departed from rules and policies. But he said authorities have refused to turn over materials related to McCabe’s disciplinary process. McCabe’s legal team at the Boies Schiller firm has sued to demand the information under the Freedom of Information Act. They’re arguing the documents could help them build a larger case against the Justice Department for wrongful termination and due process violations. “We don’t create secret law in this country,” Snyder told NPR in an interview. Jill McCabe lost her election and the FBI and Justice Department said she and Andrew observed the relevant ethics requirements, but Trump and allies called it an obvious conflict of interest. Word comes of McCabe’s legal case as the inspector general, Michael Horowitz, prepares to release a massive 500-odd page report on the FBI and Justice Department’s handling of the Hillary Clinton email investigation during the heart of the 2016 election. McCabe, Comey, and former DoJ leaders including then-Attorney General Loretta Lynch have been under scrutiny in connection with that report, which is expected to become public on Thursday. Meanwhile, McCabe’s conduct is also under review for possible criminal prosecution by the U.S. Attorney’s Office in Washington, D.C., which has already interviewed McCabe’s onetime boss, former FBI chief James Comey. The IG concluded that McCabe misled investigators. McCabe has denied any intentional wrongdoing. Instead, he said, any lapses in his memory or mistakes in his interviews with the IG and others were mistakes derived from the chaos inside the FBI under siege from President Trump and his allies.